The Tappex HiMould® range of brass thread inserts has been designed as a technical advancement on traditional inserts, with direct push-fitment on top of close-toleranced pins, located within the cavity of a customer’s mould tool. Traditionally, thread inserts were located by screwing onto these pins but the Tappex HiMould® simply requires to be pushed onto plain pins for increased speed thus saving time and yet whilst maintaining accuracy. With the HiMould® range of inserts, this costly and inefficient process becomes unnecessary, as the thread insert can be rapidly located on to plain pins thus giving higher productivity and reducing tool down time. Despite the use of plain pins, the unique design of the HiMould insert, still gives generally ‘flash free’ threads. Tappex HiMould® inserts have become widely used for most types of thermoplastic and thermoset plastics as they are suitable for both injection and compression moulding processes. Easier moulding – ejection because the HiMould® insert is located on a plain pin; there are no secondary operations required before removal of the moulding from the mould tool. This allows the use of sleeve ejectors or a centralised ejection screw; in turn this significantly simplifies tool design and produces easier moulding injection during production, thereby increasing productivity. Recessed – The HiMould® insert can be used in preference to post-mould installed inserts where the application of the insert is in a deep recess or cavity. In this type of situation, it is feasible to locate inserts in the mould tool, where the recess in the moulding is reflected in a protruding portion in the tool, than to attempt to post-mould install into a difficult physical situation. Standardised design – The HiMould® range of inserts has been designed as a standard item, which caters for all types of applications in the smallest possible insert diameter; easily located in mould tool. This allows the designer to standardise and avoid the necessity of designing a special insert for each new application. In turn, this eliminates high costs for manufacturing specials and enables large stocks of standard components to be held, giving immediate delivery of small or large quantities. The square face fits flush with the mould tool and eliminates flash. Customers are advised to contact Tappex beforehand for core pin design details and won’t accept responsibility if this information isn’t used without consultation leading to product failure. Lengths normally stated in mm. Thin wall applications – It’s possible to mould-in HiMould® inserts very close to the edge of mouldings or in situations where there are thin walls or bosses subject to integrity of the mould tool manufacture. This may be impractical for post-mould installed inserts. Maximum performance is created by the external diamond knurl form which includes two undercuts to knurl depth resulting in a large number of shear points being created over the whole length of the insert. 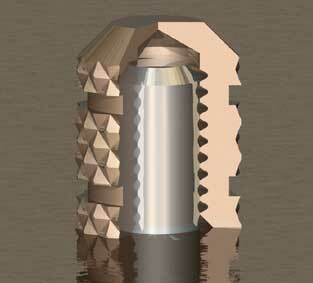 This gives better axial and radial performances than other mould-in inserts in relation to its diameter. There are three types of HiMould® thread inserts which provide a wide range of application(s) performance & benefits to support different design criteria. 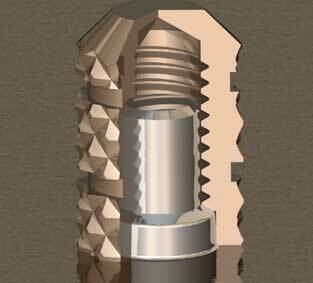 Description: The HiMould 'A' type insert for moulding-in, has an external diamond knurl form with two undercuts. The HiMould is dimensionally interchangeable with its' Yardley equivalent. 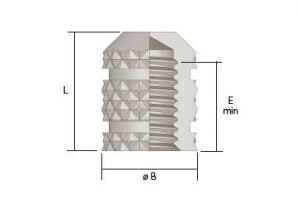 Application: This blind insert is designed to be installed onto a plain pin in the mould tool. The molten plastic flows around, and engages with, the external form during the moulding process. The shorter length over the Type C allows its use in areas where space is restricted. Provides excellent pullout performance and resistance to rotation. 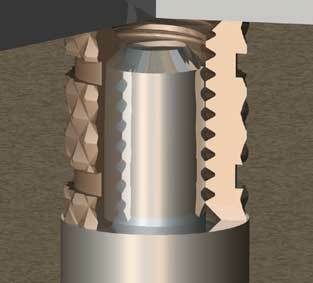 Installation: The Tappex HiMould type 'A' insert is designed to be used on a plain pin in the mould tool. It's manufactured with the internal thread produced to reamed bore tolerances. The open face is accurately machined at right angles to the axis of the insert. 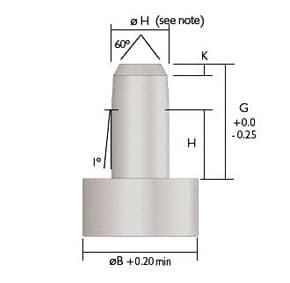 The dimensions of the tool pin allow for a slight interference fit between the pin and the internal thread of the insert, which holds it in place in the tool. The square face fits flush with the mould tool and eliminates flash. MANY VARIATIONS ON ALL OUR STANDARD PARTS, INCLUDING MALE INSERTS, ARE AVAILABLE. IMPERIAL THREAD SIZES USE NEAREST METRIC EQUIVALENT FOR EXTERNAL DETAIL. PLEASE CONTACT US WITH YOUR REQUIREMENTS. The following are downloads relating to the HiMould® range, although a downloads may also be applicable to other product ranges. General information can be found on our downloads page.